Although Italy has become subject to the power of one ruler, turning into a united country, in 1861, its cuisine had included all regions in one a long time ago. Italian cuisine is famous for its high-quality, fresh, simple ingredients. Often when we think of Italian food, we think of pasta, olive oil, as well as of various fresh vegetables, some of which are typical also for the Bulgarian cuisine, while othes are completely exotic to us. These products actually form the basis of this unique Mediterranean diet that originates from the ancient Etruscan, Greek and Roman cultures. Some common ingredients we often consider to be fundamental for the cuisine of Italy today- such as tomatoes, potatoes and peppers, for example, have been introduced into the country not so long ago, after the colonization of the American territories, but they have won a special place in the country’s cuisine, as well as in Bulgarian cuisine, where they have been introduced a bit later on. The Italian cuisine is very similar to the language of the country – there is a dominant official form that each region speaks, but at the same time every region has its own local dialect that uses. The same phenomenon is observed with regard to food. As you travel through Italy, you will notice that every region has its own specific dishes and ingredients that it is famous for, but there are also some basic ingredients such as pasta, cheese and olive oil that are used throughout Italy. The Tuscan cuisine, first of all, is very simple. Similar to the national Italian cuisine, the local culinary tradition in the region of Tuscany is based on the use of the freshest and simple ingredients of the season. These include, for example, a number of legumes, different types of cheeses and a variety of vegetables and fruits. The typical dishes are based on what Tuscans finds on the market a given week, which is fresh and locally grown. This makes the ingredients very easy to prepare and often the dishes include only a few ingredients. Although the food is simple, it has rich tastes, it also brings a lot of passion and is quite nutritious. All meals are served with the typical local bread: white, regular, unsalted bread. This tradition dates back to XVI century when there was a tax on salt. It turns out that this taxation has forever changed the way people think about making bread. This old tradition of making unsalted bread continues today, differentiating the bread of Tuscany from the bread of all other Italian regions. At first, you may think that the bread doesn’t have a flavor. But this is not true. The true role of this bread is to receive all other flavors of the food, which makes a great combination, so at the end of the meal you won‘t have any bread left. The bread is flavored also with the help of various ingredients forcrostini (see the picture) such as a paste of liver or a common and delicious grilled fettunta of bread and garlic, olive oil and salt. A great idea is to combine the consumption of fettunta with olive oil degustation – unflavored bread is the best choice to enjoy the pure taste of the local olive oil of Tuscany, which is the basis of all dishes in the region. For the production of olive oil are used the varieties moraiolo, frantoio, leccino. Other common starters are wood cutting boards, covered with various preserved meats. The plates may include prosciutto, lard and various types of sausages, as all have matured for a long period of time. Apart from its simplicity, the Tuscan cuisine can surprise you with the fact that during the months October and November its menu includes the emblematic white truffles from the town of San Miniato. The product is so common for the settlement that every year there is a festival organized especially for this luxury food. Due to the historical features of the region, many Tuscan dishes are created based on the principle that nothing goes to the trash. An example of this are the soups pappa al pomodoro –which is made of tomatoes and bread, and ribolita – a traditional Tuscan recipe including vegetables and bread. For both dishes is used mostly old bread, flavored ith various vegetables and legumes. 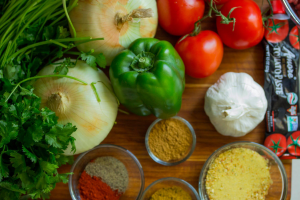 Traditionally consumed by the poor families, ribolita can be prepared with vegetables and products that are available all year round in the country – such as celery, carrots, onion and cabbage. Pappa al pomodoro is another local traditional dish, prepared only with bread, tomatoes, olive oil and garlic to taste. As simple as this dishes sound, they are aromatic enough to become favorite dishes of the local people, as well as of tourists. Other dish that you can try in Tuscany is pappardelle alle lepre al sugo di cingoli –which is as grandiose as it sounds – pappardelle with rabbit and sauce of wild pig. The ingredients are not constant, they change with seasons, so there is no standard recipe for Acquacotta. Black cabbage „Farinata“- this dish comes from the mountains and it includes yellow or corn flour. The recipe for this dish is prepared only in winter as then is the season of the black cabbage. Pumpkin soup – because it has too sweet taste for the preferences of Tuscan people, here you will always find the pumpkin in combination with strong flavored ingredients such as onion or herbs such as rosemary. „Minestrone“ (see the picture) – very famous soup that is prepared on the basis of pieces of vegetables, beans and/or pasta. Tuscan soup of chickpeas and chard or „cachucco“– a thick vegetable soup prepared with dried chickpeas and the “chard” plant, seasoned with extra virgin olive oil. Spelt soup – a small grain, similar to the einkorn wheat. This was one of the favorite dishes of the Romans who used it to feed the legions. Today it is not so popular in other countries, but in Italy is respected and the culture is widely spread. In the mountainous outskirts of Garfagnana in the Tuscan province Lucca, the farmers grow spelt, which they call „farro“ and which is endemic for the region. The historical origin of the plant from Garfagnana is recognized by law and the plant has a Certificate of protected name of geographic origin. Nowadays the ancient ingredient is still used in the preparation of fantastic soups. 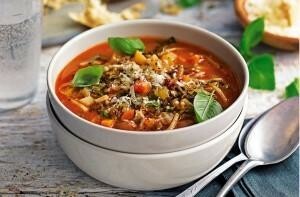 Another very ancient dish is the so-called „Bordatino“-a soup that has been prepared and consumed on ships. It is made with corn flour, beans and a variety of seasonal vegetables. Other emblematic dishes that not only come from the region of Tuscany but from its capital Florence, arethe „trippa“and„lampredotto“. Made with odds and ends, traditionally they are present in the menu of restaurants in Florence – you can try both of them on the streets or in a five star restaurant. Bulgarians also like these dishes – because they remind us of the local Balkan delicacies such as tripe. „Trippa“,i.e.beef tripe is stewed in tomato sauce for a long time in order to become tender, then it is served in marinade as a starter or appetizer. Lampredotto is seen mostly as a fast food, which you can find in one of the many food pavilions in Florence or on the markets during lunch break. 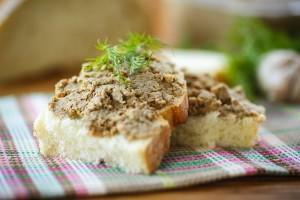 This dish is also made from tripe and is served as a sandwich with green parsley sauce and sauce of its own broth. Both foods are very typical of Florentine cuisine. Of course, we can’t talk about Tuscan cuisine without mentioning the famous steak, which comes from Valdarno and Mugello. This steak is prepared from the meat of a very special breed is very rarely served with a garnish of baked potatoes and beans. The special breed is Chianina. Since Tuscany is famous for its wild nature, part of it becomes a game and reaches the table of the local people. Traditionally in the Tuscan cuisine are used wild rabbits, wild pigs, pheasant and other birds. They are often cooked as a local stew and their sauce is added to foods made of dough. The Tuscan dishes do not differ that much from these in other regions of Italy. But maybe you will notice that you can always find in the menu dishes containing beans or some vegetables prepared in olive oil. You will often see in the menu cooked spinach or chicory in olive oil and garlic that are prepared so well – you can’t guess that you eat only a vegetable! You will also find salads, baked potatoes and, in the right season-artichoke prepared in different ways, mix of grilled vegetables such as eggplant and fried zucchini flowers in the summer months. Tuscany is not famous for its desserts, so a simple bowl of seasonal fruits is usually presentat the table. After all, after such a feast it could be difficult to find space for a dessert. The most traditional dessert comes from Prato, a city located 20 minutes away to the north from Florence. 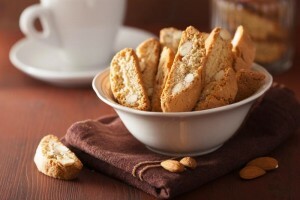 The small and hard biscuits with almond flavor, called „cantuccini“(see the picture), are served with wine to dip them in. The harmony between the sweet wine and the crispy biscuit is a perfect and light choice to finish the feast in Tuscany. Of course, we can’t talk about Italian food without mentioning the coffee. In Tuscany, as well as anywhere else in Italy, eating always ends with a cup of espresso, regardless of the time.